The Ministry of Education has supported the Ontario Association for Mathematics Education (OAME) and the Ontario Mathematics Coordinators Association (OMCA) in collaborating with a research team in a two year project. The work has been to pilot and document the implementation of Grade 9 Applied Mathematics with nine schools in ON. School teams were charged with investigating a variety of opportunities to support the teaching and learning of the Grade 9 Applied Mathematics curriculum in ways that best meet the needs of their students. This project has given new insights into a deeper understanding of the ways we can best support students in Grade 9 applied mathematics classrooms. 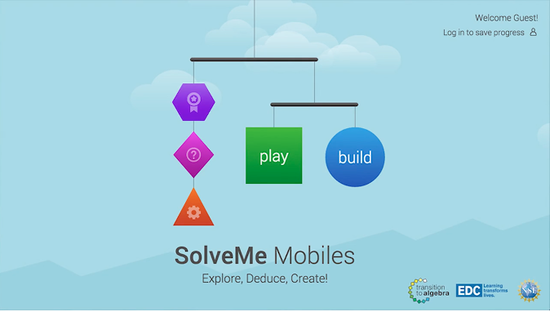 The SolveMe Mobile app is designed to support algebraic reasoning in a fun and interactive way. These colourful puzzles are appropriate for grades 7-12. The logic of balancing mobile puzzles is the same as the logic required in solving equations and systems of equations. The visual format makes these puzzles, and the logic they develop, accessible and appealing to a wide audience from age 6 through adults. ​SolveMe Mobiles has been designed both for independent, informal use and for classroom contexts where students are sharing iPads or computers and may continue their work at home. Optional user accounts record progress, awards, settings, and user-created puzzles across sessions and devices.